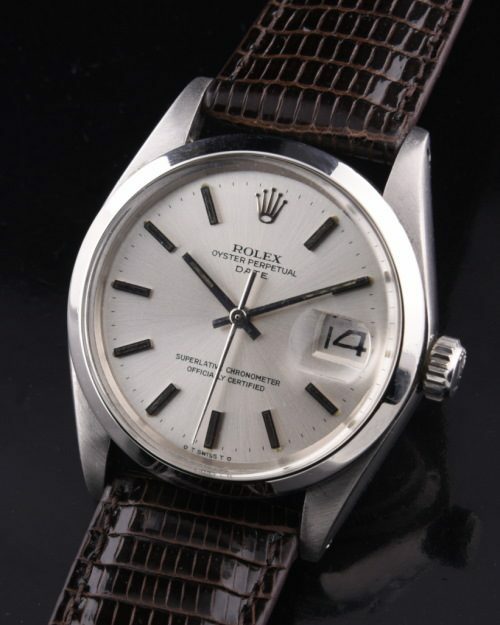 The 1972 Rolex Oyster Perpetual Date is truly the epitome of simplicity and great looks! The 34mm. steel case on this example gleams. The dial is close to pristine; with solid white gold baton markers and hands as denoted by the OT markings on the dial. The fine automatic winding ROLEX movement was just cleaned (expensively) by our ROLEX trained watchmaker. You can wear this with jeans or a suit for a lifetime and then hand it down to your son or daughter. This watch almost looks new on the wrist. This is a workhorse-reliable ROLEX! Only $2450.